1. Click on the Settings module on the left side menu. 3. Click on Add a partnership. 5. Enter a commission percentage. 6. Enter a referral code. 7. Disable automatic emails if you do not want the booker to receive an email from your system Bookinglayer as well as the partner. For example somebody may book through LUEX and will be expecting a confirmation email from LUEX. 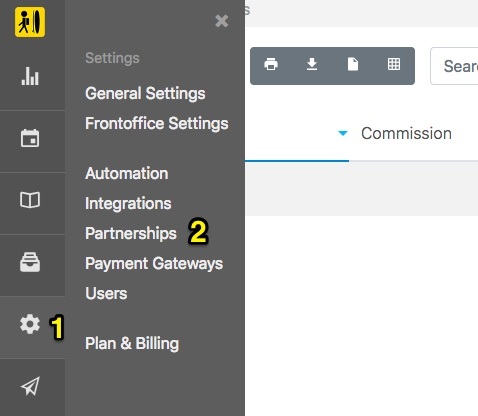 All of your partners and their commission percentages will be shown in this tab. You can assign a partner manually to a booking when you get a referral. 3. Select the booking you want to assign a partner to. 4. At the bottom right corner of the booking page, you will see a Referral drop-box where all your partners will show. Click and choose which partner would you like to assign to this booking. 5. After step 3, you will see a box saying that your referral has been added. The booking will now be listed on the Referrals (Bookings > Referrals) tab. With the MyAllocator integration, your partner bookings will automatically enter your Calendar. Click here to read more. We are working on an option to give partners or affiliates access to your backoffice to make direct bookings. They will have restricted access and only be able to view your availability. 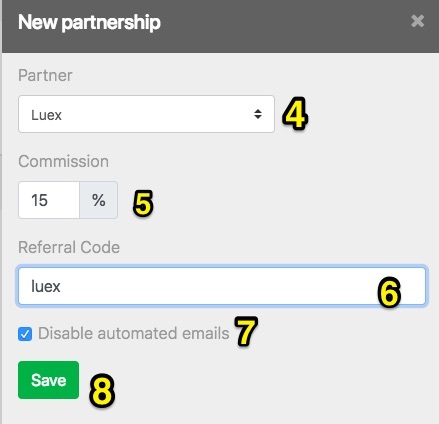 All bookings made from your partners will automatically be assigned to that partner, with the applicable commission, and will track in your referrals list in the planning module. Stay tuned for more details.